Hace unas semanas os pedimos vuestras preguntas con respecto al Día de Acción de Gracias o Thanksgiving. Gracias a todos por vuestras preguntas, Penelope ha intentado contestar a todas ellas en las clases de inglés de la ESO. Pincha en la foto para ver lo que hemos trabajado en clase y dejar tus comentarios. This party is celebrate in USA, the fourth Thursday of November. In this party the families get together in their houses and they do a big dinner for to give thanks for the harvest and all they have in their life. The dinner consist of turkey, stuff, sweet potato and other things more. I think the Thanksgiving Day is a special day for Americans because they remember the day the draught finished. The old people of America ate and bécame friends of American native. 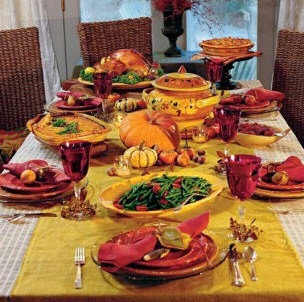 The first Thanksgiving day happened in 1621. Today they eat turkey, stuffing , yams and pumking pice. The families play football,watch may´s thanksgiving day panade ,go to give thanks and help others. President giving a pardon to a turkey,black. I would toe at the dinner because that food is new for me. Hi I'm Alex Iacob from 2°A. I really like classes with Penelope. She answered all my questions and now I haven't got any doubts about Thanksgiving Day, She is a good teacher!! Acción de gracias o Thanksgiving?